Home > Upcoming Bikes > Four New Benellis Coming This Year! 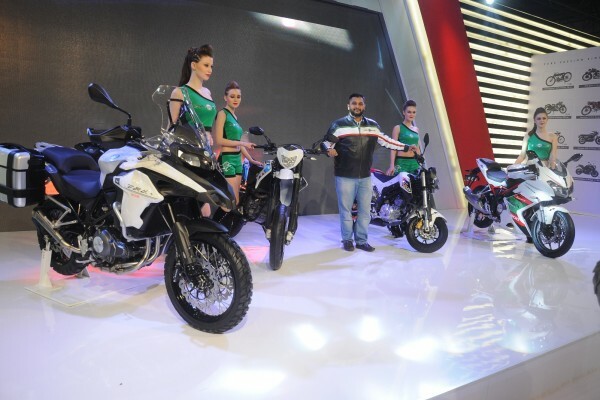 One of the most interesting pavilions today at the Auto Expo happened to be DSK Benelli’s. The company unveiled four new motorcycles and said that we may expect them all to be launched in the coming months! Unlike many others, there were no concepts (which anyway never get to see the light of the day), no year-2050 promises, no drama, just an honest display of bikes getting launched this year, along with the company’s current lineup. We had informed our readers about the company’s plans in anexclusive earlier, and staying true to its word, DSK Benelli did bring its adventure tourer, the TRK 502, to the expo. The second upcoming bike happens to be a Ninja 300 / YZF-R3 rival. It’s called the Tornado 302, and is basically the faired version of the naked 300 by Benelli, the TNT 300. However, the Tornado will come with ABS (still unclear whether optional or standard) making it the only faired twin in the segment to get it. However, DSK Benelli will have to really undercut the Japs’ pricing by a fair margin if it intends to make any dent in this segment. Two more bikes, the BX 250 Motard and Naked T-135, were also displayed. While the former carries an 890 mm high saddle, the latter is a 125 cc motorcycle with 12-inch wheels. I’ll just lay down their specs below and you may let us know in the comments section how you feel about these two. The company also showcased the soon-to-be introduced ABS variants of its TNT 600i and TNT 600 GT.